Don’t let getting from A to B, drive you round the bend. Introducing our Car Pads and Bands. These products are designed to gently discharge any electrical pulses you build up whilst travelling by car, making you feel more relaxed, alert and less fatigued. The Car Pad is a simple conductive seat pad which gently drains off excess electrical charge from the body. This charge can cause much of the fatigue and stress related issues we encounter whilst driving. Conductive carbon particles built into the pad gently discharge any detrimental charges from the body into the cars chassis. The net result is a lower burden on the body’s nervous system. Drivers report feeling calmer, more alert, and less fatigued whilst driving. Car grounding may even reduce symptoms that electrically sensitive individuals typically experience in the car. Helps keep you calm and focused at the wheel. Helps to prevent fatigue and aches caused by long journeys. Uses a coiled stretchy cable for safety. Is compatible with all makes and models of car. We also supply fully adjustable vehicle ankle or wrist bands which can be used by passengers only. These bands work in the same way as the pads, as described above but are made out of a soft elasticated fabric. Why not work on your wellness, whilst at work! 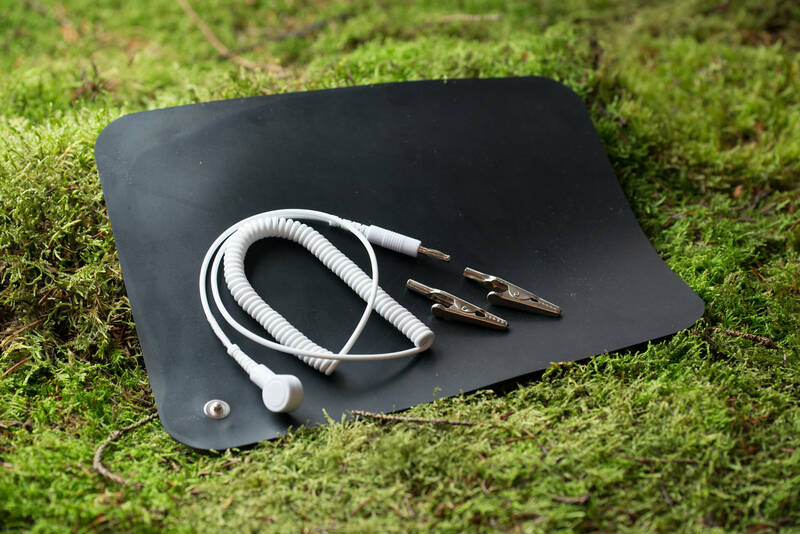 Our Grounding Desk Mats provide a smart, professional, unobtrusive method of keeping yourself earthed whilst at work. 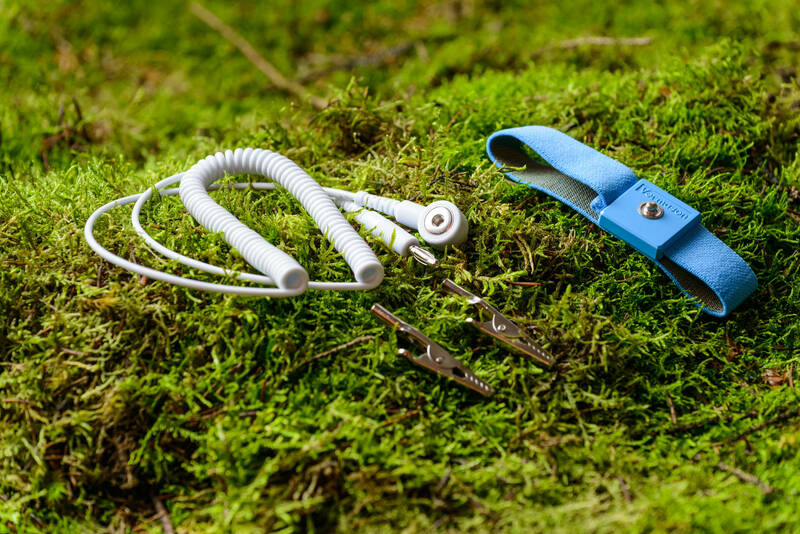 They are made out of high quality durable rubber infused with conductive carbon. The mats provide a smart and professional way of grounding your entire body with the minimum amount of fuss or disruption. Desk Mats Features: The solution to daytime and evening grounding, supporting daytime vitality. High quality finish giving a subtle and professional look. Easy to use - simply place on your desk and plug in. Provides efficient, stress busting grounding all day. Helps improve mood, focus and productivity. Can be used as a Mousemat. Further information and sizes can be found below. Don't be all fingers and thumbs, let grounding give you a helping hand into wellness. Our Hand/Mouse Mats are an easy way to become earthed and are perfect for those with localised hand/wrist issues such as arthritis. Hand/Mouse Mat Features: Localised healing - Our Grounded Hand/Mouse Mats are specifically designed to target hand and arm issues such as; Arthritis, Carpel tunnel syndrome, RSI as well as sprains and strains. The solution to daytime and evening grounding, supporting daytime vitality. Small, lightweight and easily stored. Unobtrusive and simple to use, just plug in and you are ready to go. Flexible - Can be used as a Hand mat, Mouse mat, Single foot mat, Back pad or any other way you can think of. Further information and sizes below.